Everyone knows that the words Jersey and Diners go hand in hand. Some areas of Jersey are better than others and the same applies to their diners. Well with a very hip and stylish décor inside and out, Colonial Diner (CD) in Woodbury, New Jersey is one of the better ones around. With rock bottom prices that diners are known for, yet serving a delicious meal, CD hit all the right notes and I was very happy with my visit. 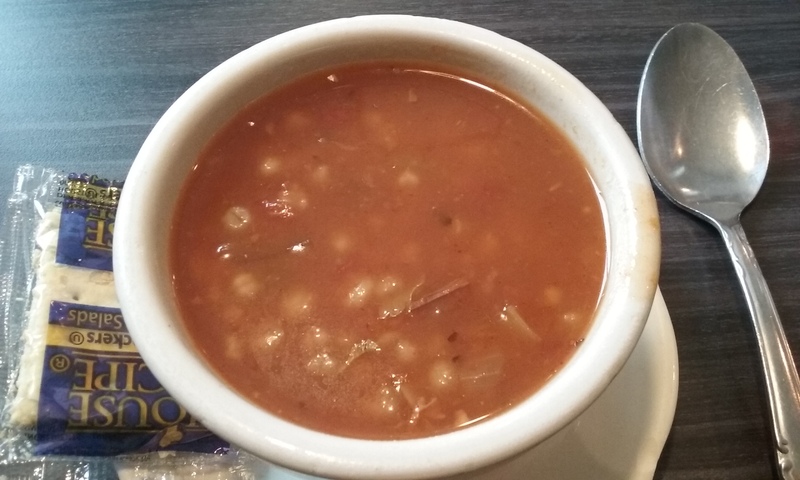 The beef barley soup started things out and was very yummy. 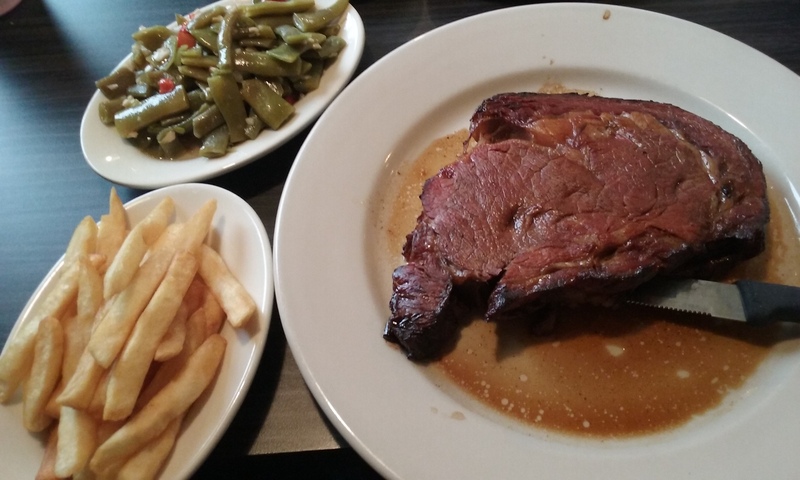 Then my main entrée of prime rib with Italian style green beans and fries was not the best version of prime rib, but for the price paid was by far one of the better ones I have had in a non-steakhouse setting. Service was friendly, efficient, and from start to finish CD was a pleasure to dine at. I will certainly visit again the next time I am in the area. Posted in Restaurants and tagged beef barley, best place to eat in woodbury nj, colonial diner, one of the best diners in jersey, prime rib. Bookmark the permalink. With an interesting choice of décor, The Pub is more reminiscent of a relic from medieval times than something originating from the 1930’s. The architecture is gothic and overwhelms immediately upon entering the dining area. With an open space so large, I think they could take all the tables out of the middle of the room and still have enough room for horse jousting, sword fighting and jesters juggling while enjoying a meal. If these events would have been occurring, I can honestly say The Pub would have automatically received five stars, but sadly the large dining area was only less than half full with the other side of the room darkened, so The Pub will need to shine on their culinary skills. The French Onion Soup arrives and had onions that seem to have been stewing for ages in Merlin’s magic cauldron, which is right up my alley. Too many times do I order French Onion Soup that is too watery, broth too thin, or onions that have not been cooked long enough or not even caramelized. The mozzarella cheese was plentiful and cooked well done. The Pub provides a quality French Onion Soup. Main entrée ordered was the Prime Rib. The Prime Rib comes out beautifully cooked and tender accompanied by steak-cut french fries that were just slightly overcooked and a Yorkshire Puff that really needs to be substituted with something else as it adds nothing to the meal and actually brings it down. I must say that The Prime Rib really shined as it was fantastic, but more Au Jus was needed and if onion rings were to replace the Yorkshire Puff it would greatly enhance the experience. For dessert the Apple Cobbler Ala Mode, was only marginal. It was good, but something was just missing to make it a recommendation. The Pub is difficult to review or explain fully what dining here is really like. The food is consistent and a degree above average, but with tweaks could be phenomenal. The atmosphere is old-world style odd, but with a full house of diners, I could only imagine what hanging in the lounge with live entertainment and then enjoying a meal here could be like. The Pub needs an innovative and unique marketing campaign to kick start a new era here because it really is somewhere special to go. Heck, maybe they would even have Bluejeanfoodcritic appear. Otherwise if they stay with their current business plan, The Pub may be left to be remembered only in history books like the medieval symbols shown predominantly throughout the establishment. Posted in Restaurants and tagged award winning steakhouse by steve harvey show, best steak house in america, French Onion Soup, King Arthurs Table, Merlin, prime rib, steakhouse south jersey, steve harvey, steve harvey best steakhouse, The Pub, the pub pennsauken, The Pub Pennsauken Review, the steve harvey show. Bookmark the permalink.